Then you can download RILEY MACK for free during the month of April as one of your two Audible Original selections. One of Chris Grabenstein's funniest, most exciting stories re-imagined as an Audible Original. With a full cast of actors, music, sound effects, and lots of laughs, Riley Mack And The Other Known Troublemakers is now a new-fashioned version of an old-fashioned radio show—perfect for kids of all ages! What do you get when you add up 1 middle school bully, 2 bank robbers, 57 puppy-mill dogs, 4,000 missing dollars and 5 daring troublemakers led by the one and only Riley Mack? One crazy caper! In this merry, mischievous romp, master storyteller Chris Grabenstein introduces Riley Mack, an unforgettable twelve-year-old hometown hero. 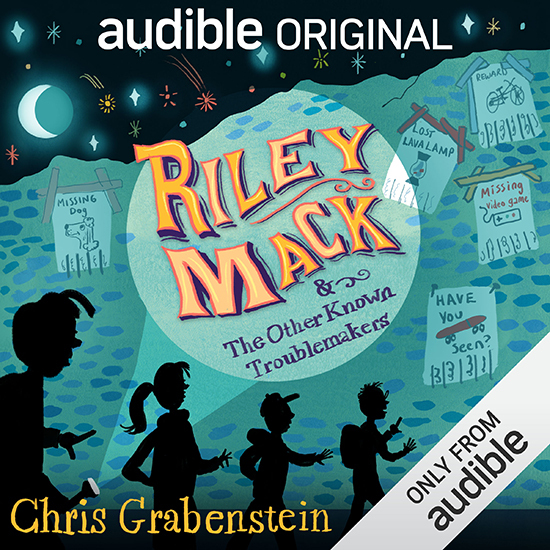 Equal parts Mission Impossible and Scooby Doo, Riley Mack And The Other Known Troublemakers is a lively, full-cast audio drama, available exclusively at Audible. Chris says: “As a fan of classic radio shows, I was super excited for the chance to take one of my favorite creations and turn into an audio-only Audible Original for kids. With a full cast, sound effects, and music, I think my book works even better as a new fashioned version of an old fashioned radio drama." Casting Trivia: Chris's wife, J.J., plays Riley Mack's mom. Chris, himself, plays two different small parts! Go behind the scenes of the Audible Original with author/performer Chris Grabenstein. Check out the Behind-the-Scenes video interview... with puppies!